Dislocations is out now from PS Publishing. Project Kon-tiki, the world’s first extra-solar colony expedition, is just weeks away from departure, and tension is mounting at Lakenheath Base. Psychologist Kat Manning is one of the eighteen specialist whose clone will be sent to the stars, and her job is to work with the original specialists, the ‘left behind’, to monitor and support them through their dislocation… But when Kat is kidnapped by the Allianz, a faction opposed to the colonisation program, more than just her safety is at stake. The entire mission is in jeopardy. 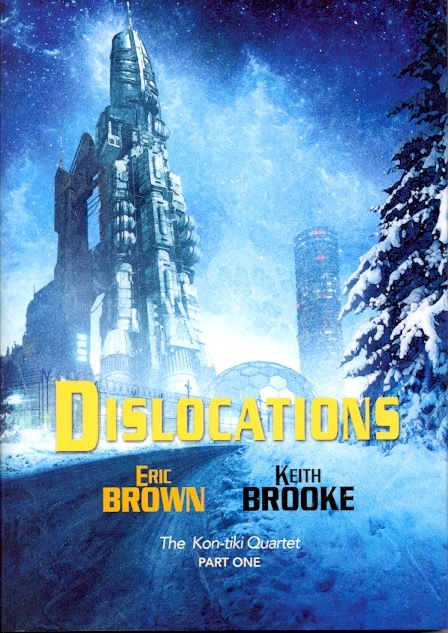 In Dislocations, the first volume of the Kon-tiki Quartet, Brown and Brooke tell the story of humankind’s last-gasp efforts to reach the stars, set against the backdrop of an Earth torn apart by looming environmental disaster.